After a historic demonstration last week, the #EleNão (“Not Him”) campaign will once again mobilize protesters next Saturday, Oct. 6. 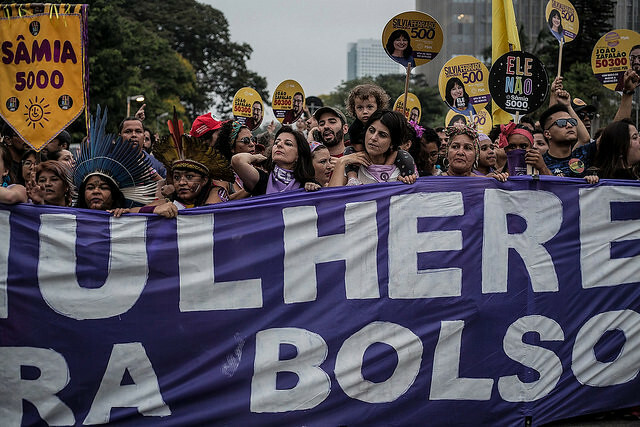 Last week, on Sep. 29, women and allies took to the streets in Brazil and around the world to protest against the rise of intolerance, sexism, LGBTphobia, and racism in the country, represented by far-right candidate Jair Bolsonaro. Now they will march once again a day before the first round of the elections. Next Sunday, Oct. 7, Brazilians will vote for president, governor, Congress, and state legislature. A runoff vote may take place on Oct. 28 if no presidential and gubernatorial candidates win a majority in the first round. ::: VIDEO: #EleNao: Why did thousands of women hit the streets of Brazil? The organizers are planning the event as a way to create spaces of resistance, conversation, and solidarity as Brazil faces a hate-ridden political climate. Within the electoral law, they also point out that the demonstration will not endorse any candidates. As events are emerging on social media calling for fake protests, the organizers are warning demonstrators to be careful about the marches they attend. In Rio de Janeiro, for example, a fake rally was called by a Bolsonaro supporter. In São Paulo, where the main protest will take place, 148,000 people RSVPed to the event on Facebook. Last week, the women organizing the marches released a manifesto against fascism.